So you have read about behavioral targeting and want to get started but are concerned about spending the money on a Behavioral Targeting tool. If that’s the case then continue reading. This article will show you how you can easily deploy behavioral targeting capabilities with minor coding on your site and without spending any money on a tool or engaging a Behavioral Targeting vendor. Below I have outlined the Behavioral Targeting process in simple steps and next I have provided an example. This process is affordable and lets you test the water before you get fully engaged in Behavioral Targeting. 1. Identify the user segment that you want to target e.g. “In market auto buyers” – You can also build a monetization model. Monetization model is not necessary but allows you to prioritize and determine what segments make sense. I am not going to get into details of how to build a monetization model in this article; you can contact me if you need help with building the monetization models. 2. Identify what content views (behaviors) will determine the segments. Eg. Users who have viewed 2 or more pages related to auto loans. 3. Determine what content, message or product you want to show to users who fall in those segments. e.g. A banner ad targeted to this segment. 4. Build a capability in your code to read/write a cookie as user views the content that defines the segment. e.g. Write a cookie every time user views the auto loan related page. 6. Build a capability in your pages to read a cookie and then serve contents based on the cookie value as users continues to browse the site or comes back for a repeat visit. 7. 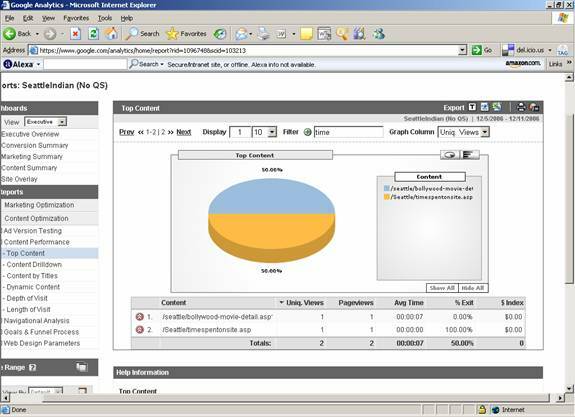 Create reports in your analytics tool based on segmentid cookie to see the behavior of your users who are in that segment. This helps you better understand your target segments. This is an online bank and wants to target those users who are in market to buy a car. 2. A user who views at least 2 pages the car loan section or starts a loan process funnel but does not complete it will be identified as the “In Market Auto Buyer”. How did I determine how many pages or what pages will put a user in this segment? I made it up. How you determine what defines a user segment will depend on your particular business and goals. 3. I want to show my target users a banners and links which will prompt them to fill the auto loan application (loan process funnel). a. Read the cookie called “segmentdonotrget”, if this cookie has a value of CAR001 do nothing, you do not want to target this customer. You are done. b. Read the cookie called “segmentid”, if this cookie exists and has value of CAR001 then, you don’t need to track this user any more, this user is already in your target segment. Go to step 6. 6. On every page of the site read “segmentid” cookie and if you target segment “CAR001” exists then serve ads or links to “Auto Loan” to these users. 7. Once the user completes the auto loan process, write the segment id in “segmentdonotrget” so that you do not target this user again. I have tried my best to explain this process. If anything is not clear then please do write to me and I will make sure to clarify it in this article. I have come across this KPI over and over again. Many of my clients want to report it on frequent basis and some even have this as one of their goals for the site. However, I am surprised to find that not many people (not even a lot of web analysts) understand how this metrics is calculated and what this is actually reporting. I am personally not oppose to tracking this metric but have an issue when people try to set goals with respect to improving time on site without knowing what this metrics is actually measuring. What are the issues with the metrics? Let’s start with looking at the issues with “Time Spent on the Site” or “Time Spent on a Page” metrics. 3. Visitors are multitasking, causing inaccuracies in actual time spent on the site. 5. Download time of the page – Time spent on page calculation includes time taken to download the page. 1. Last page viewed is not counted in the “Time Spent on the Site” calculations. – All most all of the tools (Since I don’t know exactly how many tools are there and how each of them work, I am using almost instead of saying all the tools) use the time lapsed between 2 page requests to calculate “Time Spent on Site”. Since last page viewed does not have any subsequent page request, there is no time lapsed recorded and hence the time spent on last page is not counted in the calculation. Web Analytics Tool will show Avg. Time on Site as 30 seconds instead of 1 min and 40 seconds, the actual time spent by the user. 2. Single Page visits – Since this is the first and the last page viewed by a visitor, as explained above this page views is not counted in “Time Spent on Site” calculations. Single page visits are very common due to search engines and other sites linking deep into the site, this is especially true for content sites (news, articles etc.). Users search or click on links and then read the content spend 5-10 mins and then leave. These users will never be counted in “Time Spent on Page/Site” calculations. If yours is a news/content site then I can assure you that you will be underreporting the time spent on site due to either large percentage of single page visits or the users clicking on few links (within seconds), finding what they are looking for and spending majority of the time (few mins) on the last page and then leaving the site. 3. Visitors are multitasking – Most of the time visitors are multitasking. If they are at work they are doing their regular work, talking to other, getting coffee etc. A visitor opens site, views it for 20 seconds, gets distracted come back 20 mins later, pick up the site where she left, clicks on another link views that for 2 mins, clicks another link views it for 20 seconds and then leaves. Does this happen a lot? You bet, look around talk to your colleagues you will find this happening all the time. How much time will be reported by web analytics tool? 22 Mins. Is that correct? No. Isn’t the actual time viewed 2 mins and 40 seconds. 4. Tabbed browsing – Tabbed browsing even complicates the issue. Jason Burby’s article http://www.clickz.com/showPage.html?page=3623280 talks about how tabbed browsing has made it much easier to open different page of the site and multiple sites. Jumping to another site, opening various pages of the same site complicates the calculation of time spent on page/site. A visitor comes to the site, within 1 min opens 10 pages in different tabs that he/she wants to view. Now spends 1 hour looking at these pages. What will web analytics tool report as the time spent on site? 1 min, even tough user viewed it for 61 mins. 4. Download times of the pages - If a page takes longer than normal to download it will affect the time spent on the site. User might spend 10 second downloading while only 5 seconds viewing the page, however time spent will show 15 seconds. So with all these inaccuracies is this metric still useful. I think it still has a value as long as you understand what this metrics is showing. a. Single Page Visits – Change in single page visits will affect this metrics. If you search engine rankings have changed that can affect single page visits and hence time spent on site. b. Navigation on your site – it either is obstructing finding the correct information (time spent goes up) or has improved so users are getting right to they content they are looking for (time spent goes down). c. Problems with a page – This can cause users to exit site prematurely, causing time spent on the site to go down unless the problem is on one of the pages with very high exit ratio. Since the last page is never counted in calculating time spent, a user who exits after seeing this page or exits after getting an error on this page won’t make much difference in time spent on the site calculations. d. User Behavior - If nothing else changed, then users might be either multitasking more than before or are using tabbed browsing. This will result in changes in the time spent on the site.